A century and a half later — in 2003 — Japanese company Hitachi merged with a storage-department of american IBM to form a new company Hitachi Global Storage Technologies. Full of new Napoleonic plans (including the one to become in future the largest manufacturer of disk drives) and rich expertise of both companies in designing and manufacturing hard disks, it decided to start designing new desktop hard disks of unprecedented capacity — 400 GB. 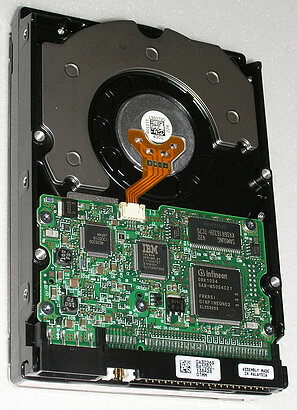 The team of IBM designers already had a vast experience of building multiple generations of desktop storage devices, the latest projects being hard disks of Vancouver (Deskstar 120GXP aka AVVA) and Vancouver 2 series (Deskstar 180GXP or AVV2), based on 40 GB and 60 GB platters correspondingly and comprising up to three platters in senior models. Besides, IBM already had Vancouver 3 almost ready for mass production (yep, the name "Vancouver" survived, though it's still news for some people ;)), officially named Deskstar 7K250 by the new company (users called it VLAT/VLSA by the key letters in model designations), already based on 80 GB platters. Its senior 250 GB model also used three platters and six heads. 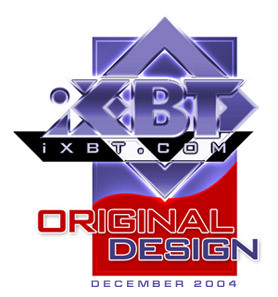 These disks appeared on sale in autumn 2003 and proved themselves worthy. As it's getting increasingly difficult to raise the record density of platters (see "Digest 2004"), the new 400 GB models from Hitachi are manufactured using time-proven 80 GB platters, by packing as much as five such platters (and 10 heads) into the standard 3.5-inch housing! So they got back to the long forgotten old solution — long before this model, famous DTLAs and still earlier IBM disks regularly featured 5 platters in senior desktop hard disks — Deskstar 75GXP, 34GXP/37GP, 22GXP/25GP and 14GXP/16GP series. :) Frankly speaking I don't remember any other hard disk manufacturers in the recent past (if not take into account the 5-platter IBM DTLA-307075 y2k model and some earlier IBM models of the Deskstar series) to boast of such solutions — 8 heads for 4 platters had been considered the best achievement for 3-inch ATA hard disks, and "tighter" platter packaging was the lot of the elite SCSI storage devices. So we can establish a fact that the joint Hitachi-IBM team managed to combine both enterprise and desktop level technologies in its first desktop project (or remember its "blue" past). The first creation of Hitachi GST got a symbolic in-house (not marketing) name — "Kurofune". After that "black ship", which 150 years ago had become a symbol of american infiltration into the japanese market and mutual benefits. And let's hope that this symbol is not associated in this case with conflicts and wars between those sides. :) What concerns official titles, these disks were named Hitachi Deskstar 7K400. They will be the main heroes of our article. 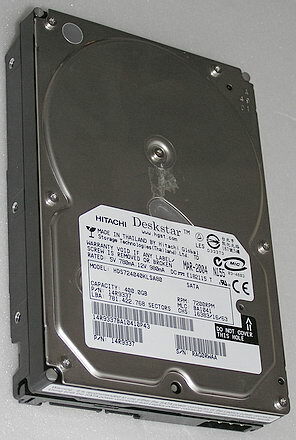 Hitachi Deskstar 7K400 hard disks cannot be reviewed out of context of their direct predecessors — Hitachi Deskstar 7K250 and IBM Deskstar 180GXP. Besides, having reviewed in 2004 the Serial ATA and UltraATA Deskstar 7K250 models of average capacity (see the corresponding reviews at the provided links), we still haven't tested the senior 250 GB SerialATA model of the Deskstar 7K250 (Vancouver 3) series — HDS722525VLSA80. This model is also very interesting in itself — as a forerunner of Deskstar 7K400 (Kurofune) in particular. That's why the HDS722525VLSA80 model will also feature in our today's review, together with the HDS724040KLSA80 and HDS724040KLAT80 models of the Deskstar 7K400 series with serial and parallel interfaces correspondingly, which were released a year later. The main rated characteristics of Hitachi hard disks of Deskstar 7K400, 7K250 and 180GXP series are presented in Table 1. Table 1. Main characteristics of Hitachi Deskstar 7K400, 7K250 and 180GXP hard disks with 7200rpm spindle rotation speed. One can notice that 7K400 and 7K250 series drives use practically the same 80 GB platters (probably formatted slightly differently) with the data density of 62 Gbit per inch2 and the same max and min read-write speed. Five platters and ten heads in Kurofune hard disks didn't deteriorate their rated access time — the same average 8.5 ms as in the 7K250 and 180GXP series. The other characteristics also remained the same as in 7K250, except for the acoustic noise, shock resistance, power consumption, and weight. But if the inevitable "deterioration" of Kurofune in comparison with Vancouver 3 in acoustics, weight, and the buffer area taken by firmware cannot be called considerable, the "novices" lost noticeably more in power consumption and shock resistance compared to the "old guys". The power consumption increased at least by 2 Watts (in comparison with the senior 7K250 models; by the way, power consumption specified on top of the hard disks do not always coincide with those marked in the specifications on the official web site), so Kurofune may require additional cooling (over 10 W in operating mode — that's not a laughing matter) and the non-operating shock resistance at 225G was characteristic of desktop hard disks four years ago. Fortunately, operating shock resistance of the new hard disks did not become worse. Deskstar 7K400 series consists of only two models — 400 GB each, with serial and parallel interfaces. Less capacious Hitachi Deskstar models still pertain to the 7K250 series. However, very soon Hitachi is to announce a new series of its desktop hard disks, where everything may be noticeably different. It's hard to tell when these disks will appear on sale though, so consumers will have content themselves with the 7K400 and 7K250 for a long time. The only difference between the two models of the 7K400 series is actually different interfaces — UltraATA/133 and Serial ATA (see Table 2). Table 2. 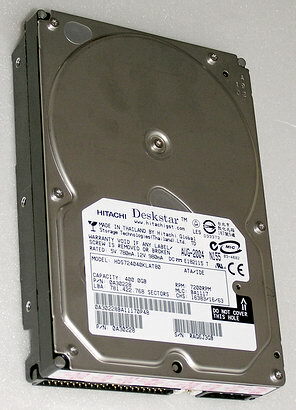 Specifications of Hitachi Deskstar 7K400 hard disks with different interfaces. 1 GB equals one billion bytes when referring to hard drive capacity; accessible capacity may be less. 2 Buffer capacity includes 271 KB used for drive firmware. Note that while the 7K250 is announced to have ATA-7 and UltraATA/100 interfaces at 100 MB/sec (180GXP uses ATA-6 at the same speed), the 7K400 features the same ATA-7 but already with UltraATA/133 (which is honestly reported by utilities, demonstrating maximum UDMA-6 mode for SATA/UATA 7K400 models and maximum UDMA-5 mode for SATA/UATA 7K250 models), though according to the specification its transfer rate is still 100 MB/sec instead of 133 MB/sec as appropriate to a true UltraATA/133 (UDMA-6). However, direct measurements demonstrate that the interface data rate in UATA 7K400 disk can really be faster than 100 MB/sec, that is UltraATA/133 is not an idle declaration but a physical reality. It's just that the official on-site specification contains an error. Besides, interface differences between the 7K400 models result in increased power consumption of the SATA model — approximately half a watt higher, as well as in the 7K250 series. 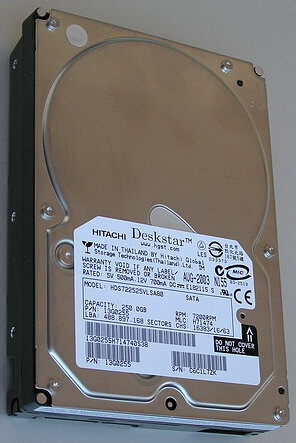 UltraATA (on the left) and Serial ATA (on the right) controllers in Hitachi Deskstar 7K400 hard disks (HDS724040KLAT80 and HDS724040KLSA80 models respectively). 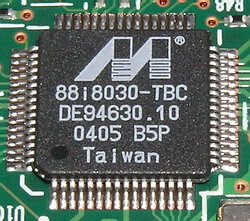 and a bridge, which translates the parallel interface into the serial, based on the "super-popular" (in the recent past) Marvell 88i8030 chip. By the way, the 7K250 series hard disks (the SATA model HDS722525VLSA80 under review in particular) uses the same parallel interface controller — Infineon 08K 1054 SAB-M3054C21. Though as we have already noted above, according to the specifications and data utilities the maximum speed mode of hard disk controllers is different in the 7K400 and 7K250 series: UDMA 6 (ATA-133) for the former and UDMA 5 (ATA-100) for the latter (Marvell chip supports up to UDMA 6). Hitachi Deskstar 7K400 and 7K250 hard disks: the HDS724040KLAT80 (above) and the HDS724040KLSA80 (in the center) with UltraATA and Serial ATA interfaces correspondingly and the HDS722525VLSA80 (below). 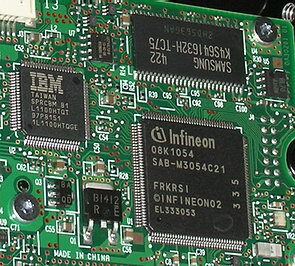 These models look a tad differently: there has again appeared a screw over the spindle axis on the top cover of the "five-platter" cans (perhaps it "reinforces" the construction, as it was in IBM hard disks in the DTLA era), and the 7K400 PCB has grown in size compared to similar (in interface) 7K250 models. The form of the massive plate on the back of the can has also been changed. It's nice of Hitachi to use "double" power supply for SerialATA models — you can power the storage device either via the new standard SerialATA power connector (which is necessary, for example, when you want to use these disks in "storage-cages" and mobile racks) or via the traditional four-pin connector (which is guaranteed in any power supply unit, even in the old models). Though in practice, when testing SATA devices of the 7K250 and 7K400 series I found out that when powered via a SATA power connector these devices were not very stable and sometimes they started to clunk their heads (sudden multiple cycles of parking-lifting off). This negative effect disappeared only after the disks were powered "after the old way" — via the 4-pin connector (we haven't noticed such effects in hard disks from other manufacturers). Let's write it off to the "presence effect" and hope that there will be no such thing when these drives operate with proper power supply units or power adapters. Besides, Rotation Vibration Safeguard technology improves hard disk performance in high vibration conditions. It's designed for three or more hard disks used simultaneously. Latched SATA connector is an improved latch for Serial ATA connectors, which prevents self-disconnects, for example, in high vibration conditions. Hitachi emphasizes that Deskstar 7K400 hard disks are designed not only for traditional high-performance and gaming PCs and workstations, but also for NearLine Storage (disk-to disk backups, archive and constant content storage, data loss prevention and data restoration), as well as for digital video recorders, home media-servers, and video editing and storage devices. It's also stressed that these disks use the latest interface technology — ATA-7, which provides for the special set of commands to transmit data streams (including audio and video) and has an improved SMART diagnostics (including self-diagnostics). Among the useful ATA-7 features one can note reading storage device attributes and configuring the disk buffer for better performance, recording data streaming errors to reduce error correction delays and obtain complete data restoration after these errors. Aside from these three "top" models of the 7K400 and 7K250 series, our review also features another two Hitachi models for comparison purposes (we shall compare them with hard disks from other manufacturers another time) — the HDS722516VLAT20 160 GB hard disk, which is also from the Deskstar 7K250 series, but with UltraATA/100 interface and 2 MB buffer (all the other models in this review have 8 MB buffers), and a senior hard disk of the previous generation (based on three 60 GB platters) — IBM/Hitachi Deskstar 180GXP, IC35L180AVV207-1 180 GB model with UltraATA/100 interface and 8 MB buffer. 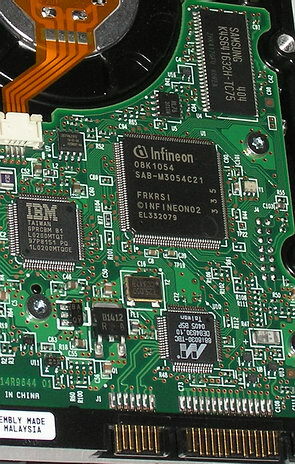 The hard disks were firmly fixed on the metal chassis of the PC case and connected to UltraATA/100 or Serial ATA controller on the ICH5 bridge of the motherboard. The main hard disk was installed as master on the first channel of the chipset controller, and a hard disk to be tested was installed as master on the second channel of the same controller. All the hard disks tested in this review had no problems with overheating and deterioration of characteristics at least during the six days of intensive testing. No additional cooling (special coolers and fans) was provided for the hard disks. Before the tests, we warmed the hard disks for 20 minutes using a utility with active random access. The tests were carried out under MS Windows XP Professional SP1. The hard disks were tested not partitioned (in Intel Iometer, H2Benchw and AIDA32 tests) as well as partitioned and formatted by regular operating system tools depending on a test type: one NTFS partition of maximum size for testing the average access time and plotting the read speed graph in WinBench 99 and two NTFS or FAT32 partitions of the same size for other tests (WinBench Disk WinMark 99, copying files with various patterns, ATTO Disk Benchmark test, multithreaded read/write Nbench 2.4 test and the hard disk speed test in Adobe Photoshop). Each NTFS partition occupied half of the entire disk capacity (that is the second partition started exactly from the second half of the disk). FAT32 partitions were 32768 MB, the first one starting at the outer edge of the media (on the "fastest" tracks), and the second – exactly from the middle of the media volume. NTFS and FAT32 cluster sizes were selected by default – 4 and 16 KB correspondingly. We used AIDA32, H2benchw and WinBench 99 to determine physical characteristics of the disks (average access time, interface data rate, and linear read/write velocity of platters). To evaluate the overall performance we use multiple patterns in Intel Iometer, a good test C'T H2Benchw, hard disk operations in Adobe Photoshop, multi-threaded reading and writing files and the universally recognized WinBench 99 (though we try not to rely on the last package in our conclusions, because we have often noticed hard disk optimizations for this test package). First of all I want to note that we noticed no such negative effects as "noisy" and "floating" graphs in the 7K400 and 7K250 series disks as we previously came across in the senior 180GXP model. Despite the more capacious 80 GB platters, designers obtained steadier "data reception" by HDD heads. :) Hitachi still uses the "traditional" approach to platter formatting, though in its future desktop series we can expect so-called "adaptive" platter formatting, which has been long used in mobile storage devices from this company in order to increase the data density (up to 70 Gbit per inch2 versus 62 Gbit in desktop hard disks of the same generation) and reliability. Hard disk graphs (in terms of one platter) practically match within each series (7K400 and 7K250), but inter-series graphs are somewhat different. Firstly, by the number and layout of formatting zones: I have visually counted 19 distinctive zones in 7K400 and 24 zones for 7K250 (the specifications claim 29 and 30 zones respectively). Secondly, formatting zones in 7K400 and 7K250 models are obviously different almost across the entire platter area. This difference is the most prominent in the first (the fastest) two thirds of the disk, where the zones in the 7K250 are located "higher" in general (i.e. read/write speed is obviously higher), and one can note that the zones in different hard disk series match only in the last third of the platters. The latter effect is also demonstrated in the following: while the 7K400 hard disks slightly (homoeopathically) outscore the 7K250 series in maximum (in the very beginning of the media) linear read speed, the predecessors are noticeably faster (by 3%) than the novices in the average read speed, see the diagram below. And, for example, the 7K250 is faster than the novices by 10% in the middle of the media! The 7K400 is a tad slower than the old guys in its minimum speed as well. IBM/Hitachi hard disks have always been very fast in interface data rate (UltraATA or Serial ATA). There is practically no gap between the models and series here, while SATA disks are approximately 20% faster in interface data rate than their UltraATA/100 counterparts. However, with their 8 MB buffer this difference will hardly be the determining factor in terms of disk performance in applications. The senior SATA model from the 7K250 series turned out the fastest by its real average access time — just 12 ms, which is noticeably better than in its competitors (from other manufacturers). Though, to be just, I want to note that even 7K400 models with quite heavy blocks of 10 heads were only miserably outscored by the leader and leave behind most competitors as well as the six-head hard disk of the previous generation — IBM 180GXP. As you may have already guessed, all modern desktop Hitachi hard disks support seek acoustics control via the Acoustics Management register. Acoustics in 7K400 and 7K250 series models was set to disabled (register value — 255dec) by default and the hard disks are rather noisy in active seek mode — especially 7K400 models! However, you can considerably reduce the seek noise by modifying (for example, using Hitachi Feature Tool) the value of this register to 128dec (or any other value, which is less than 192dec). This will increase the average access time approximately by 4 ms — up to a little over 16 ms. In this review we tested a 7K400 SATA model both in normal and in quiet slow seek modes, to understand how much performance is lost to quiet operation. Additional information is provided by the comparison of the average access time measured separately for reading and writing — we may try to evaluate the efficiency of lazy write procedures and caching of written data in the buffer by how much the average access time drops in writing compared to reading. Another illustrative test of the "interior design" of the hard disks is the read/write speed on files of various sizes with various block sizes — from 512 bytes to 1 MB. For this purpose I traditionally use ATTO Disk Benchmark. The screenshots below display the results for the four sizes of a test file — 128 KB, 1 MB, 4 MB, and 32 MB. While the first and the second file sizes are, as a rule, surely cached in the disk buffer (caching read/write data for a 1 MB file is not that simple), there is simply no room to fit in the last file size. Caching the last but one file size depends not only on the buffer size, but also on the hard disk firmware (by the way, results of this test practically don't depend on the choice between FAT and NTFS). ATTO Disk Benchmark results for Hitachi Deskstar hard disks. On the whole, IBM/Hitachi hard disks have not suffered any considerable changes in their firmware optimization for reading and writing files in various block sizes (judging from this test) for the three generations (from 180GXP to 7K400) — graphs for the hard disks of the three generations are very much alike. According to the test results we can draw a conclusion that the optimization of all Hitachi hard disks for the smallest blocks is satisfactory, though not the best among desktop competitors — the hard disks reach the full speed only at blocks starting from 16 KB. Moreover, while firmware optimization of the hard disks for reading files is generally good (anticipatory reading allows to read files of up to 4 MB practically at the speed of ATA interface), one cannot say that about caching writing data — even at relatively small 128 KB files the speed is obviously lower than the maximum possible speed (that is the interface data rate) and it's especially noticeable in SerialATA hard disks. When the file size increases to 1 MB, their writing speed drops (unlike the reading speed), and 4 Mb files (and less than 2 MB files for hard disks with 2 MB buffers) are written by the hard disks at the speed of their platters, not the interface data rate. That is caching data for writing stops being effective, though caching reading data still works well. One can note that the situation with caching data for writing (megabyte files) is a tad worse for 7K400 series hard disks than for their predecessors 7K250 and even 180GXP. It can be clearly seen even at 32 MB files, by the way. The 7K400 hard disk demonstrates practically no difference between the quiet and normal seek modes. On the whole, taking into account the results of this and the previous tests, caching data for writing in 7K400 series hard disks is a tad worse compared to 7K250 series hard disks. 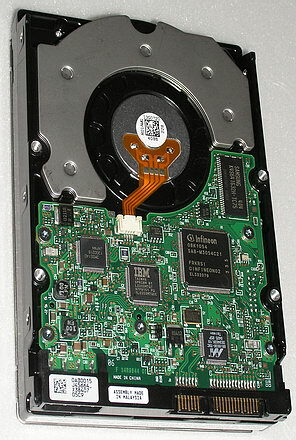 While it still remains rather (in some cases – very) effective with small files and blocks, caching data for writing with megabyte files gets noticeably worse in modern desktop Hitachi hard disks, though caching data for reading remains very effective for file sizes of almost up to the cache buffer. Now let's see how the pros and cons of the hard disk design noted above reveal themselves in applications. At first, let's find out how well the hard disks are optimized for multithreaded operations. For this purpose I traditionally use NBench 2.4 tests, where 100 MB files are written to disk and read from it in several simultaneous threads (in this case we use FAT32, though this test demonstrates similar results on NTFS). This diagram lets us evaluate the efficiency of multi-threaded lazy write procedures of the hard disks in real (not synthetic, as on the diagram with the average access time) conditions when the operating system works with files. Actually, the picture is similar for all Hitachi hard disks: all of them (but a tad worse than some competitors) cache well data for multithreaded writing, even if writing threads are spaced wide apart within the hard disk and they lose not more than half of their data rate on the average. The old 180GXP has suddenly become a winner by the total points taken (which correlates with the results of ATTO test on average files), the silver medal is shared by the 7K400 UATA and 7K250 SATA models. They slightly outscored the 7K400 SATA model, which is practically equally fast in quiet and noisy seek modes. And the last place (though still not lagging far behind) is taken by the hard disk with 2 MB buffer. The situation is different in multi-threaded reading: all Hitachi hard disks lose more than half of their data rate already with two closely spaced threads. And when the two threads are wide apart, the data rate drops almost by ten times! Both 7K400 models are leading in this test, their performance losses at "quiet seek" being about 10%. On the whole, multi-threaded reading cannot be considered the strong point of Hitachi hard disks, though these disks are good at caching data for reading single files of the average size (judging from the ATTO test and some other). Now let's see how these hard disks fair in the elderly but still popular Disk WinMark 99 test from the famous WinBench 99 package. We carry out these tests not only "for the beginning" but also for "the center" (by capacity) of the storage medium for both file systems. All Disk WinMark 99 tests have the same outsiders both in Business and High-End performance — the 7K250 hard disk with 2 MB buffer is always the last, losing from 15% to 33% to the leaders in performance; and the last but one is the senior model in the 180GXP series, which is not that much outscored by the leaders — 10% on the average (from 5% to 13%). 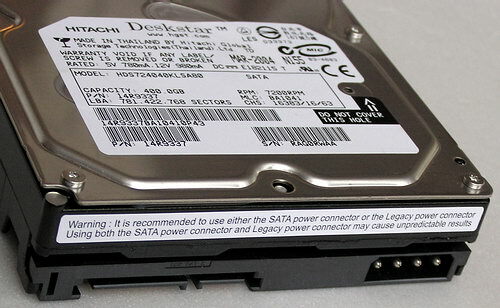 Senior SATA hard disk of the 7K250 series is the absolute leader. It has won in seven out of eight tests — the best seek time and average platter data rate make themselves felt. This hard disk is closely followed by the 7K400 UATA model, which outscored its SATA counterpart in five tests out of eight: as you can see, faster interface is not of much help, though it's the fault of additional latency because of the interface translator in the SATA model. What concerns the quiet seek mode in the 7K400 model, in these tests it does not deteriorate the performance but even improves it in half of the cases. However, these improvements are so small that they are within the test error limits. And now — newer complex performance tests in PCMakr04 and C'T H2BenchW benchmarks. They both "play back" prerecorded hard disk activity tracks in corresponding applications and measure the completion speed of each track, and then they average the results. The disk test in popular Futuremark PCMark04 is often used by common users for express-evaluation, though it's not free from shortcomings. We provide its results not for the sake of an objective picture but to let our readers get their bearings on their own results. All japanese models provide very similar results and offer the following picture: The UATA novice is winning with a small breakaway, it's followed by the old SATA model. "Quiet" hard disks are slightly outscored by noisy ones. Similar "track" test H2benchW is more sensitive to model differences: the senior 7K250 SATA model is again an obvious leader, as in WinBench 99 tests, both 7K400 models are practically on a par (and the quiet seek mode is not an obstacle). The outsiders are natural (the WinBench 99 situation is repeated), though they are outscored by the leaders by 30% or even more! The outsider in working with Adobe Photoshop temp file is the oldest hard disk — even its 8 MB buffer was of no help against the HDS722516VLAT20. The leaders in this test are the new 7K400 hard disks (including the option with the quiet seek mode). Perhaps, larger capacity allows them to outscore the senior 7K250 due to smaller range of head movements during the test (closer placement of necessary sectors and tracks). The old 180GXP and 7K250 models with their small buffers look the most advantageous in large query queues, though in small queues the senior 7K250 model is leading. 7K400 hard disks lag behind almost all other predecessors in this pattern, though not always significantly. I also want to note that the graphs for SATA and UATA Kurofune models are almost matching here (they overlap each other) and they both lag behind the 7K250 SATA model at a constant gap (which, by the way, is demonstrated by many other patterns in IOmeter test below). File Server pattern offers almost identical picture to that of the Database Server pattern. We can only note that the model in quiet slow seek mode is even farther behind. Having averaged (in terms of geometry, without weight coefficients) the results of the three previous server patterns, we got both 7K250 models in the lead (the junior model with 2 MB cache is the first due to its better results with a large request queue), the old 180GXP is the third, while 7K400 novices are the last, being outscored by their predecessors by 3-7%. So, it's not a good idea to install the 7K400 in servers that actively operate with small portions of data. What concerns the Workstation pattern, it has the same leaders as in server patterns. The three-platter 180GXP even slightly outscored the three-platter 7K250 due to more effective operations with a large request queue, though the latter is still better at small loads. 7K400 hard disks are again outsiders here. Ambiguous picture can be seen in the imitation of reading and writing large files (like mp3, video, large photos, etc): the old 180GXP is obviously leading in reading. It is followed on the heels by both 7K250 models, which are noticeably faster than the 7K400 models. But writing offers a completely different picture — 7K250 hard disks become the leaders (the SATA model outscores the UATA model due to its buffer), while 7K400 hard disks, though noticeably behind the leaders, are positively bronze winners, having outscored the 180GXP. But if we average the results, the old Vancouver 2 still manages to worm its way between the two "Kurofunes". The "quiet" model is certainly outscored by the "sterling" one. But while this difference is considerable in reading, it's negligible in writing (remember the excellent results in reading and writing access times). Both the japanese and the americans demonstrate almost complete "unanimity" in imitating reading and writing small files, but they show a wide spread of "opinions" in writing. 7K250 series hard disks are again the leaders here, and the quiet modification of 7K400 SATA model (complete correlation to the write access time test, though the block sizes in these tests are noticeably different) "bursts" (that's definitely the right word for it) into the third place. On the average, 7K400 series models look well, having outscored the 180GXP, but still inferior to their preceding 7K250 models. Test results of the patterns imitating the small and large file copy procedure can be fit into a single small summary graph (see above). But to my mind, a diagram will be more illustrative (see below). Large file copy imitation offers similar results for all contenders, except for the 180GXP — the difference between the 7K250 and the 7K400 is just a couple of percents for the 7K250, though the 7K400 loses more in quiet seek mode — 4%. But the difference between Hitachi hard disks grows in the imitation of small file copy procedure — both 7K250 models are positive leaders (SATA is again a tad faster due to a larger buffer, while UATA is faster with larger request queue). The old 180GXP even outscored the new 7K400 models, getting generally on a par with them in performance in these tasks. If we average the results of the previous patterns geometrically (reading, writing, and copying large and small files) with two queue depths (1 and 64), we get the picture shown on the diagram above this paragraph: both Deskstar 7K250 models are the leaders "by total scores" (the senior one is a tad faster than the junior with four times as small buffer and slower interface), which outscore both 7K400 series hard disks by approximately 10% (SATA model turned out a tad faster). Frankly speaking, such noticeable gap between the novices and their direct "forefathers" cannot be written off to the increased seek time and number of platters. All the more – to the 10% lag in linear read speed in the platter middle. Perhaps, the reason is in modified firmware procedures (as we have seen above, they do not always lead to performance gains). As a result, in these consumer patterns the 7K400 models are only 5-6% ahead of the former hero — the senior hard disk from the Vancouver 2 series (180GXP). Though it did not best them even in the quiet seek mode. The remaining several patterns only confirm the logic discovered above. In defragmentation imitation "the old guys" are again out of reach of the new hard disks from the 7K400 series, and the quiet seek losses are noticeable. And finally, the pattern of streaming read/write with large or small blocks discounts the differences between the hard disks, granting the podium of honour to Kurofune models at least for some time. We shall review the acoustic properties of these hard disks in more detail in another article. And here I want to note that both five-platter Hitachi Deskstar 7K400 hard disks are subjectively almost the noisiest ones among modern desktop disks. And while the rotational noise (clanging and rumbling) due to liquid dynamic bearing is not that noticeable (though subjectively it's more prominent than in 7K250 series hard disks), the rattling heads in active seek mode leave no doubts that something is actively operating near you. :) Frankly speaking, I don't see any point in having this hard disk in your room, while there are quieter solutions. Though it won't be very disturbing in quiet seek mode even at night. What concerns power consumption and heat dissipation, you can see these characteristics of 7K400 series hard disks in their specifications in the beginning of the article. Seemingly horrible at first sight (over 10 W in operation mode! ), they turned out rather mild: fixed in the metal chassis of the PC case (without any additional cooling or air flow), the 7K400 series hard disks have never overheated to a dangerous level for the six days of active testing — their temperature was fluctuating between 42 and 50 degrees Centigrade, and it was lower than in some desktop hard disks from other manufacturers. So the real power consumption of these hard disks is probably noticeably lower than claimed in their specifications. Thus, Hitachi Deskstar 7K400 hard disks have achieved a new capacity record among 3.5-inch desktop storage devices (400 GB) using a long forgotten configuration with five platters and ten heads. Now a 1U-format data storage device can hold up to 1.6 terabyte of data instead of 1 terabyte for the previous generation of Deskstar drives. I would also like to award Hitachi Deskstar 7K400 hard disks with our editors' "Original design" award. But was the game worth the candle? From the point of view of a home or office user — I doubt it very much! 7K400 series (Kurofune) hard disks turned out a tad slower in performance than their direct predecessors and forefathers — Deskstar 7K250 series hard disks (Vancouver 3), though they use practically the same components! The new hard disks are also worse in their noise level, power consumption, and shock resistance than the old models. The capacity of a single disk is not surpassed yet (so far). But these days only the "laziest" chipset does not have a RAID-controller, so it's no problem to combine two 200 GB or even 300 GB hard disks into a stripe and to obtain 400-600 GB and approximately 1.5 times (or even two times) as high performance as in Kurofune (literally — two 200 GB models will cost approximately as one Kurofune)! I could have published performance results of a simple RAID-array of two 200 GB hard disks, but the review would have been devoted to absolutely different issues then. ;) Believe me, this RAID of two modern ATA hard disks will have practically the same noise level as one Kurofune. What concerns power consumption — is it that important for a desktop? So the new Hitachi giants of desktop hard disks are designed for: (1) those users, for whom the word "cool" is very important, and (2) professional purposes, which Hitachi stresses in connection with these models: not for traditional high-performance and gaming PCs and workstations, but rather for NearLine Storage (disk-to disk backups, archive and constant content storage, data loss prevention and data restoration), as well as for digital video recorders, home media-servers, and video editing and storage devices. These 7K400 series hard disks "specialize" in such streaming (including audio and video) utilizations (ATA-7, new firmware algorithms, and all that). However, according to our tests, these Hitachi optimizations provide no special advantages in this class of tasks so far. We are looking forward to the new series of desktop hard disks from this manufacturer, which are soon to be expected.